We do tree stump grinding the cheapest for you. Please call 858-997-7062 for a Free estimate, or visit our website also for much more information, thank you, Vince. Stump Grinding: We can grind down most any regular size tree stump for $125 or cheaper if you have more than one. that is the price most places charge to rent a stump grinder, so WE charge what you would rent one for, but WE do the work also, so you don’t have to! I can usually give you a quote over the phone, after I ask her several questions, like is the stump easy to get to, is is near any windows or underground lines. (you can call 811 to find out if you have any lines underground where you want the work done. My machine is about 250 pounds and 30 inches wide, so if you have steps or some place hard to get to, I can probably get it done, but I have to know all the answers, then I can give you a price right over the phone, or the internet here. 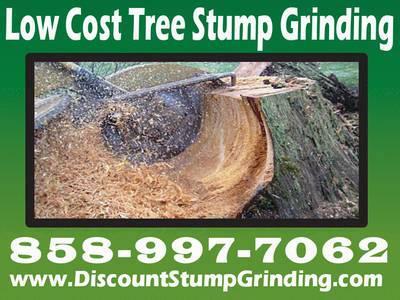 We do work for other stumps for tree landscapers, that charge the customer more, and we do it for them, if we do it directly for you, we will charge you the cheapest price, kinda like wholesale stump grinding. If you have several stumps, please give me a call for a quote.